Occasionally we let a gem-of-a-game slip through the cracks. And once we realize our oversight, we'll make it a point to feature the game even if it's not brand-new, and particularly during times like this when new releases are slow. One such title is On The Run, an absurdly fun little game hosted and contracted by Miniclip Games, developed by Officine Pixel. This Shockwave game is a third-person car racer, or rather chaser, as you spend the entire game being pursued by a mysterious, clandestine group of baddies called the "Corporation" that's trying to hunt you down and run you off the road. You sport a little yellow coupe, while the bad guys have a fleet of cars, SUV's and vans, all of which stop at nothing to wreck your car and stop you from escaping. What are you escaping from? Why are you "on the run" in the first place? It's never really explained, and it doesn't need to be. The fun of this game isn't the story, it isn't the characters...it's the gameplay, plain and simple. You'll be surprised that despite all the flashy racing games available today, you can have such a blast trying to outrun and outwit your pursuers in a little Web game made a couple years ago. You control the car using the [arrow] keys and [space] to hit the e-brake. Once the starting light turns green, you're let loose in a Euro-style city with no map, no Crazy Taxi-style arrow pointing you in the right direction. The city is unfamiliar and yours to explore, although you won't have much time to enjoy the scenery as you push the pedal to the metal, gunning it through intersections, tunnels, ramps and even down narrow alleys. You have only two things to worry about: your car's health and gas, both of which are measurable by meters at the top of the screen. Run out of gas and it's game over. Wreck your car and obviously it's game over. You can replenish these meters with gas and repair power-up orbs, both which seem plentiful at first, but get tougher to find as you zoom farther along. Besides trying to find your way out of the city to the goal, you'll constantly have Corporation bad guys chasing you from behind, trying to ram you from the side, and even coming at you head-on as you turn corners. The intuitive strategy is to dodge them, although if you take advantage of the game's decent AI, you can trick enemy cars into crashing by hitting the brake at just the right moments, or pulling a 90-degree-turn out of the blue. Analysis: On The Run is one of those diamonds-in-the-rough; a simple, small game that doesn't feature mind-blowing graphics or cutting-edge physics, it's just ridiculously fun to play. Your initial run may take anywhere from 15 to 45 minutes to beat the game, depending on how many times you fail. Once you've memorized the route, the game can be beat in under 10 minutes, but even that doesn't water-down the replay value. There are always alternate routes you can take and new ways to lose the bad guys. The driving mechanic is quite gratifying, featuring simple-yet-responsive steering and accurate inertia physics. (Just the traction component alone is awesome.) Collision physics can sometimes get iffy; especially when you get boxed in (your health will often drain super-quickly without an ability to escape). But if you've ever wanted to take a few minutes out of your day and pretend you're the star of an action movie during the famous car-chase scene, you'll love what this game has to offer. Note: For those on Intel-based Macs, you will need Shockwave Player 10 and run your browser in Rosetta emulation mode to play this game. This game is a real classic. Anyone who hasn't played it should definitely do so. Consider it a part of your 'casual game history' education. Who actually uses the brakes in this game? I only have one real gripe in this game, and it's that you can easily get wedged between an enemy car and something else, and have it drain you from full health to zero in ~1 second, and it can happen out of the blue (so you can be quite far along and doing well, and suddenly die with no warning). I made it to the second train crossing, but it gave me a cutscene of the train passing through, and then said I was "captured"? What am I supposed to do? > Note: For those on Intel-based Macs, you will need Shockwave Player 10 and run your browser in Rosetta emulation mode to play this game. Well, I tried that too. But neither Shockwave Player 11 (in native mode) nor Shockwave Player 10 (in Rosetta) works. Either way, I get an error that "This application requires an Xtra (Havok Physics Scene) that either does not exist or failed to initialize properly". I'm using Safari 3.1.1 on Mac OS X 10.5.3. Peter - the Havok extra is included in Shockwave Player 10, so is it possible that your Rosetta emulation mode browser actually has the version 11 player? Try uninstalling Player 11, then reinstalling player 10. That worked for me (Safari 3.1.1 and Mac OS X 10.5.3). Ah, I found the problem. I'd installed Shockwave Player 11 first, and Shockwave Player 10's installer didn't completely delete it, so Safari kept using 11. So make sure you delete 11 before installing 10. There's a bug in the Euro-style town: You can drive through the cul-de-sac and end up in empty space. There are actually several reasons to use the brake. One of them being stopping short of an ambush, of which there are several. Small tip....when you reach the overpass, don't actually drive up on it until you see something cool happen. You need to drive as quickly as possible over the train tracks. If you don't get through before the bars come down, you're "captured." It's not perfect. Sometimes it glitches. Once I even lost all of the enemy cars and did wheelies around the place. This game ROCKS. It was the first racing game I ever liked or completed, and the beginning of my flash game addiction in early college. Good choice for a review! this really reminds me of that old game "streets of simcity"
this game has a POINT!?!?!?!?! i guess it's time to try again! because this is shockwave and making all online games "flash games" doesnt sound right. I absolutely LOVE this game!!!! I'm like Vinny; I had no clue that this game actually HAD a point. But now that I KNOW what the point actually is, it's sooo much funner!! What a conidence! i wanted to find this game yesterday! for all the people who haven't finished, the exit is: driving into an outside sewer, going LEFT, and passing the cross road. watch the enemys run into the bars and fly up! This reminds me of "Need for madness" - demolition derby + racing game, in my opinion, "Need for Madness" is better, you aren't defenseless anymore, you can crash their car with yours. I especially love how the authors "economized" by forcing you to retrace your tracks and integrated it smoothly into the gameplay via railway ramp - it makes the game longer, and it creates a nice twist by making you work against yourself although you are not even aware of it at the time (because you've picked up all the easy-to-get powerups, they will now be missing when you need them the most). This looks like it'd be a fun game if it didn't glitch constantly. Three games in a row I got the 'no-wheel-traction' glitch. Every other time, I ended with the instant death wedge that ribs was talking about. What a terrible, buggy, laggy, horrible game. Seriously, there's something badly badly wrong with it. Finally this game is featured on jayisgames!!!! I've been playing it 3 years ago but the website was taken down and now I found it again!! kinda glitchy...but nontheless fun...there is actually a way to get the baddies off your back..what i did was i went to the stone paved road area and i turned back and i somehow made the crash and i went back to the stone area..and they couldnt find me..
so in other words, they cant see you if u hide..
after i made it to the 2nd train crossing and made it through, the baddies made it through as well..and in the ending movie, they did catch me.. Finished in 4 minutes 11 seconds! Sadly, I always get to the part where some large, somewhat colourful vehicle blocks my path and then I'm always trapped with no choice but to die. Can anyone give a full route to how to escape? I always get stuck when i cross the bridge and go into that little village place with small streets and stuff. From then no, choice but too die. Anyone help? Hi all...here's a short walkthrough. Feel free to explore new routes to do this, but here's the requirements for a win. 1. From the stoplight, proceed straight up the hill, avoid the SUV that comes from the left at the top. 2. Make a LEFT turn at the top of the hill and then proceed straight, passing the car lot, and the billboard. Go downhill. 3. Keep going, passing the office building and on around. You'll see on overpass. Get up on it. 4. Go through the alcove and continue through the twisty litte town road. You'll come out to a court yard. 5. Make a right-hand u-turn to exit the courtyard via another road. You'll then need to make a quick left. Go through the tunnel. 7. Make a left turn just before the railroad. Avoid the SUV that's waiting at the mouth of the tunnel. Proceed through this tunnel and collect the orb at the end of it. Proceed straight and then take your first left. You'll see the stoplight again. 8. Repeat steps 1 through 6 to get back to the railroad. Drive across the railroad and avoid the oncoming SUV ahead. Now, you'll see a garbage truck pull out, make a right turn there and go through the gate. 9. Make a gentle left to go past the building. Collect all of the orbs around this parking lot. Now drive over the dirt mound and drop into the sewer. 10. 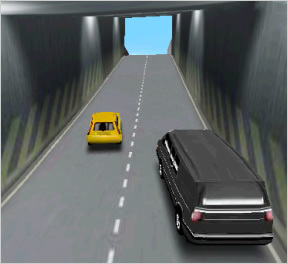 Drive as fast as possible through the sewer, narrowly avoiding the columns and the pipes that are sticking out of the sides. About 1/3 of the way through, you'll have an SUV oncoming to avoid. When you get to the end of the sewer, go up the ramp, and the make a right turn to exit the courtyard. Drive as fast as possible over the railroad and you'll just barely make it through before the gate closes, trapping your pursuers. am i just stupid because ive been playing this game for 3 yrs now, and just now realized it had a point too. i cant get past the 1st railway tracks, it stops everytime i go near it...help! Oh gosh i remember playing this in elementary school . Good times. 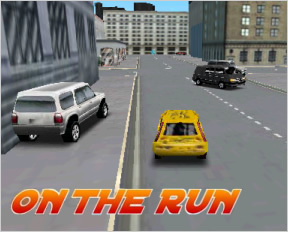 On the Run is one of my favorite game. When ever i am playing this i will forget my timings. It is very good time pass game. I love this game thoroughly.